The Real Cost takes a different approach to the dangers of tobacco use. Despite great strides in tobacco control and public education efforts, American youth continue to smoke at alarming rates. 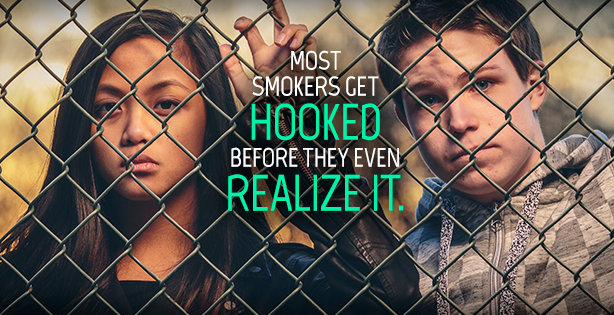 Each day, more than 3,200 youth under the age of 18 smoke their first cigarette – and more than 700 become daily smokers. Reducing these numbers is the public health challenge faced by the FDA’s youth tobacco prevention campaign, The Real Cost. Not surprisingly, the more than 10 million young people aged 12 to 17, who are open to smoking or already experimenting with it are difficult to engage on this topic. Teens think they know everything about the risks of using tobacco, and believe long-term consequences don’t apply to them. They don’t understand that every cigarette comes with a cost that’s more than just financial. The Real Cost takes a different approach to the dangers of tobacco use – one that encourages teens to re-evaluate what they think they know and convince them of the real impacts. Our messages make teens aware of the risks by highlighting consequences most meaningful to them, such as loss of control due to addiction, the visceral impact of smoking dangerous chemicals, and health effects such as tooth loss and skin damage. The FDA developed a comprehensive, yet highly targeted multimedia approach that delivers campaign messages to hard-to-reach, at-risk teens where they spend their time – in TV and radio broadcast media, the Web, cinemas, magazines, out-of-home advertising, as well as a robust presence on social media. The campaign maximizes message impact by utilizing each channel’s strengths and is exceeding best practices recommended by the CDC to achieve behavior change and improve health. Paid media has reached more than 90% of the target audience at least 15 times a quarter, and has generated about 2.5 billion digital impressions on youth-focused websites. The approach also leveraged youth influencers, highlighted by the recent release of exclusive video content featuring Zedd, Jessie J, and One Republic, which garnered nearly 7 million views. As The Real Cost enters its second year, early indications suggest it has the media reach to create meaningful change in the lives of at-risk youth. The FDA is committed to reducing the disease, disability, and death from tobacco use by preventing young people from becoming established smokers in the future. Kathy Crosby is the director of the office of health communication and education in the FDA’s Center for Tobacco Products.